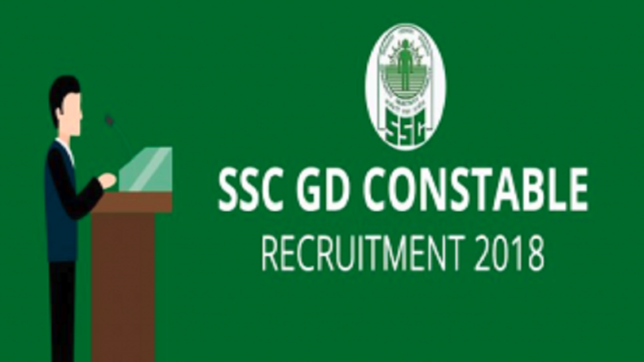 Candidates of Constable (GD) in CAPFs, NIA, SSF and Rifleman (GD) in Assam Rifles Examination-2018 are hereby informed that the Computer Based Examination for the above mentioned recruitment will be conducted by the Commission on different dates between 11-02-2019 and 11-03-2019. The examination will be held in multiple shifts. To address any variation in difficulty levels of question papers across different shifts, the scores of the candidates will be normalized by using the formula published by the Commission through Notice No: 1-1/2018-P&P-I dated 07-02-2019. Short-listing of candidates for PET/ PST and Medical Examination will be done on the basis of normalized marks scored by the candidates. Final merit as well as selection of the candidates will also be made on the basis of normalized marks. Candidate must be a citizen of India. Vacancies are state/ UT wise hence a candidate must submit domicile/ PRC against his/ her state/ UT. 18 -23 years as on 01.08.2018. Candidates should not have been born earlier than 02.08.1995 and later than 01.08.2000. Matriculation or 10th class pass from a recognized Board/ University. Candidates who have not acquired the essential educational qualification as on 01.08.2018 will not be eligible and need not apply. The candidates must bring all relevant documents/ certificates in original with self attested copies pertaining to age, education, caste, domicile, hill area, any category for relaxation, No Objection Certificate (NOC)/ discharge certificate (in case of ex-servicemen), which will be checked/ verified at the time of DME by CAPF Board. The candidates who are able to prove, by documentary evidence, that the result of the qualifying examination was declared on or before the cutoff date i.e. 01.08.2018 and he/ she has been declared passed, will be considered to have the requisite Educational Qualification. Note: All questions will be of Objective Multiple Choice Type. The computer based examination will be conducted in English and Hindi only. General Intelligence & Reasoning: Analytical aptitude and ability to observe and distinguish patterns will be tested through questions principally of non-verbal type. This component may include questions on analogies, similarities and differences, spatial visualization, spatial orientation, visual memory, discrimination, observation, relationship concepts, arithmetical reasoning and figural classification, arithmetic number series, non-verbal series, coding and decoding, etc. General Knowledge and General Awareness: Questions in this component will be aimed at testing the candidate’s general awareness of the environment around him. Questions will also be designed to test knowledge of current events and of such matters of every day observations and experience in their scientific aspect as may be expected of any educated person. The test will also include questions relating to India and its neighboring countries especially pertaining to sports, History, Culture, Geography, Economic Scene, General Polity, Indian Constitution, and scientific Research etc. These Questions will be such that they do not require a special study of any discipline. Elementary Mathematics: This paper will include questions on problems relating to Number Systems, Computation of Whole Numbers, Decimals and Fractions and relationship between Numbers, Fundamental arithmetical operations, Percentages, Ratio and Proportion, Averages, Interest, Profit and Loss, Discount, Mensuration, Time and Distance, Ratio and Time, Time and Work, etc. English/ Hindi: Candidates’ ability to understand basic English/ Hindi and his basic comprehension would be tested. The questions in all the above components will be of Matriculation level. Based on the performance in CBE, candidates will be shortlisted for PET/ PST by the Commission. Physical Efficiency Test (PET) and Physical Standard Test (PST) will be conducted at various centres finalized by the CAPFs. Detailed scrutiny of candidates’ eligibility/ documents will be undertaken at the time of DME. Therefore, it will be the responsibility of the candidates to verify their eligibility as prescribed in this notice before appearing for CBE/ PST/ PET. 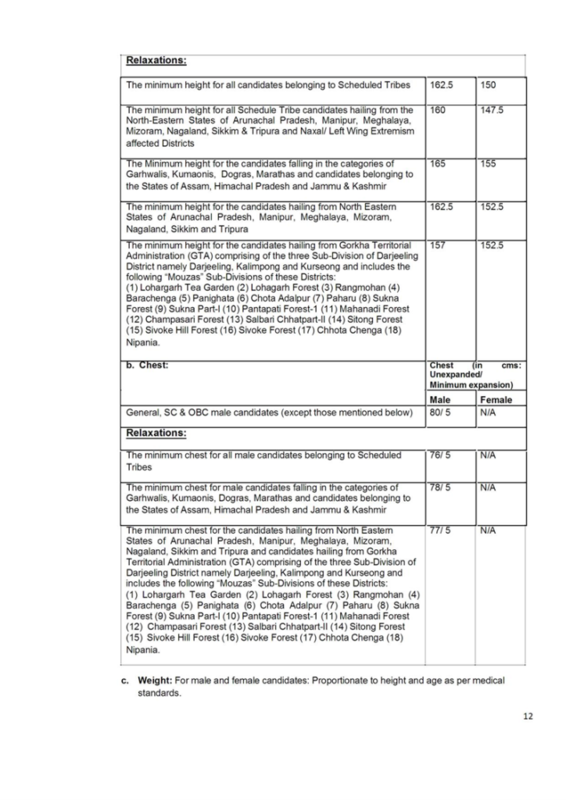 During PET/ PST, candidates who are found eligible on height parameters will undergo PET (race) followed by biometric/ technology aided identification. Scrutiny of eligibility of candidates for any relaxation i.e. age, height and chest measurement will be carried out after qualifying PET (race) before PST by CAPFs PET/ PST Boards. Chest measurement for Female candidates will not be taken. However, it should be ascertained that the chest is well developed. Scrutiny of eligibility of candidates for relaxations i.e. age, height and chest measurement will be carried out after qualifying PET (race) before PST by CAPFs PET/ PST Boards. Relaxation in height and chest (as the case may be) as mentioned above will be permissible only on production of certificate at the time of PST/ PET in the proforma as prescribed in Annexure-VIII from the competent authorities. The candidates who are declared not qualified in Physical Standards, i.e. height and chest may prefer an appeal on same day, if they so desire, to the Appellate Authority nominated for the Centre through Presiding Officer (PO). The decision of the Appellate Authority will be final and no further appeal or representation in this regard will be entertained thereafter. There is no appeal in PET (Race). Conduct of PST/ PET and DME/ RME will be the sole responsibility of the CAPFs. The Commission will not entertain any representation/ appeal/ RTI Applications/ CPGRAMs against the decision of the PST/ PET and DME/ RME Board. Matriculation/ Secondary Examination Certificate to prove age, name and educational qualification. Domicile Certificate/ Permanent Resident Certificate (PRC) issued by the competent authority. Certificate from serving defense personnel in the format prescribed at Annexure-IV of the notice. Undertaking in the format prescribed in Annexure-V from Ex-Servicemen candidates regarding completion of engagement in Armed Forces. Caste Certificate in the format prescribed at Annexure-VI and VII of the notice from the candidates seeking reservation/ age relaxation. Certificate from candidates who wish to avail relaxation in height/ chest measurement as prescribed in Annexure-VIII of the notice. Certificate from District Collector/ District Magistrate in respect of dependent applicants of riot victims as mentioned in category 04/ 05/ 06 under Para-4 (B) of the Notice. Nativity/ Identity Certificate by West Pakistani Refugee in the format prescribed at Annexure-XIV of the notice.